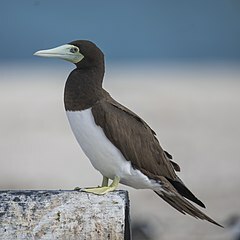 The brown booby (Sula leucogaster) is a large seabird of the booby family, Sulidae, of which it is perhaps the most common and widespread species. It has a pantropical range, which overlaps with that of other booby species. The gregarious brown booby commutes and forages at low height over inshore waters. Flocks plunge-dive to take small fish, especially when these are driven near the surface by their predators. They only nest on the ground, and roost on solid objects rather than the water surface. The brown booby was described by the French polymath Georges-Louis Leclerc, Comte de Buffon in his Histoire Naturelle des Oiseaux in 1781. The bird was also illustrated in a hand-coloured plate engraved by François-Nicolas Martinet in the Planches Enluminées D'Histoire Naturelle which was produced under the supervision of Edme-Louis Daubenton to accompany Buffon's text. Buffon did not include a scientific name with his description but in 1783 the Dutch naturalist Pieter Boddaert coined the binomial name Pelecanus leucogaster in his catalogue of the Planche Enluminées. The type locality is Cayenne in French Guiana. The current genus Sula was introduced by the French zoologist Mathurin Jacques Brisson in 1760. The word Sula is Norwegian for a gannet; the specific leucogaster is from Ancient Greek leuko for "white" and gastēr for "belly". The booby's head and upper body (back) is covered in dark brown to black plumage, with the remainder (belly) being a contrasting white. The bare part colours vary geographically, but not seasonally. The species also displays sexual dimorphism of the bare part colours, the males having a blue orbital ring, as opposed to the yellow orbital ring of the female. In addition the male of subspecies S. l. brewsteri is distinctly plumaged in having the forehead, forecrown and chin white, merging to a greyish brown neck and breast. The female booby reaches about 80 centimetres (31 in) in length, her wingspan measures up to 150 cm (4.9 ft), and she can weigh up to 1,300 g (2.9 lb). The male booby reaches about 75 centimetres (30 in) in length, his wingspan measures up to 140 cm (4.6 ft), and he can weigh up to 1,000 g (2.2 lb). Unlike other species of sulid the juvenile plumage already resembles that of the adult. They are gray-brown with darkening on the head, upper surfaces of the wings and tail, while the lower breast and underpart plumages are heavily flecked brown on white. Juveniles of subspecies S. l. brewsteri are once again distinct in having the underpart plumage more evenly mouse brown. Their beaks are quite sharp and contain many jagged edges. They have fairly short wings resulting in a fast flap rate, but long, tapered tails. While these birds are typically silent, bird watchers have reported occasional sounds similar to grunting or quacking. This species breeds on islands and coasts in the pantropical areas of the Atlantic and Pacific oceans. They frequent the breeding grounds of the islands in the Gulf of Mexico and the Caribbean Sea. With the rise in pollution in the world, brown boobies have been using marine debris to make their nests. 90.1 percent of these nest were consisted of plastic, while nests near shipwreck have a high percentage of the wreckage debris. This bird nests in large colonies, laying two chalky blue eggs on the ground in a mound of broken shells and vegetation, but usually raises just one chick, the second one to hatch being unable to compete for food with its older sibling, or even ejected from the nest by it. It winters at sea over a wider area. Brown booby pairs may remain together over several seasons. They perform elaborate greeting rituals, and are also spectacular divers, plunging into the ocean at high speed. They mainly eat small fish or squid which gather in groups near the surface and may catch leaping fish while skimming the surface. Although they are powerful and agile fliers, they are particularly clumsy in takeoffs and landings; they use strong winds and high perches to assist their takeoffs. ^ BirdLife International (2012). "Sula leucogaster". IUCN Red List of Threatened Species. Version 2013.2. International Union for Conservation of Nature. Retrieved 2013-11-26. ^ a b c d e f g Harrison, Peter (1985). Seabirds: An Identification Guide (revised ed.). Houghton Mifflin. p. 292. ISBN 978-0-395-60291-1. ^ Buffon, Georges-Louis Leclerc de (1781). "Le Petit Fou". Histoire Naturelle des Oiseaux (in French). Volume 16. Paris: De L'Imprimerie Royale. p. 142. ^ Buffon, Georges-Louis Leclerc de; Martinet, François-Nicolas; Daubenton, Edme-Louis; Daubenton, Louis-Jean-Marie (1765–1783). "Fou de Cayenne". Planches Enluminées D'Histoire Naturelle. Volume 10. Paris: De L'Imprimerie Royale. Plate 973. ^ Boddaert, Pieter (1783). Table des planches enluminéez d'histoire naturelle de M. D'Aubenton : avec les denominations de M.M. de Buffon, Brisson, Edwards, Linnaeus et Latham, precedé d'une notice des principaux ouvrages zoologiques enluminés (in French). Utrecht. p. 57, Number 973. ^ Mayr, Ernst; Cottrell, G. William, eds. (1979). Check-list of Birds of the World. Volume 1 (2nd ed.). Cambridge, Massachusetts: Museum of Comparative Zoology. p. 186. ^ Brisson, Mathurin Jacques (1760). Ornithologie, ou, Méthode contenant la division des oiseaux en ordres, sections, genres, especes & leurs variétés (in French and Latin). Paris: Jean-Baptiste Bauche. Vol. 1, p. 60,Vol. 6 p. 494. ^ Jobling, James A. (2010). The Helm Dictionary of Scientific Bird Names. London: Christopher Helm. pp. 223, 373. ISBN 978-1-4081-2501-4. ^ Gill, Frank; Donsker, David, eds. (2017). "Hamerkop, Shoebill, pelicans, boobies & cormorants". World Bird List Version 7.3. International Ornithologists' Union. Retrieved 2017-11-05. ^ Redman, Nigel; Stevenson, Terry; Fanshawe, John (2016). Birds of the Horn of Africa: Ethiopia, Eritrea, Djibouti, Somalia, and Socotra – Revised and Expanded Edition. Princeton Field Guides. Princeton, New Jersey: Princeton University Press. p. 44. ISBN 978-0-691-17289-7. OCLC 944380248. Retrieved 2018-12-13. ^ Ospina-Alvarez, A. (2008). "Coloniality of brown booby (Sula leucogaster) in Gorgona National Natural Park, Eastern Tropical Pacific" (PDF). Onitología Neotropical. 19: 517–529. ^ Grant, L.M. ; Lavers, J.L. ; Stuckenbrock, S.; Sharp, B.P. ; Bond, A.L. (2018). "The use of anthropogenic marine debris as a nesting material by brown boobies (Sula leucogaster)". Marine Pollution Bulletin. 137: 96–103. doi:10.1016/j.marpolbul.2018.10.016. ^ Dorward, D.F. (1962). "Comparative biology of the white booby and the brown booby Sula spp. at Ascension". Ibis. 103B (2): 174–220. doi:10.1111/j.1474-919X.1962.tb07244.x. O'Brien, Rory M. (1990). "Sula leucogaster Brown Booby" (PDF). In Marchant, S.; Higgins, P.G. (eds.). Handbook of Australian, New Zealand & Antarctic Birds. Volume 1: Ratites to ducks; Part B, Australian pelican to ducks. Melbourne, Victoria: Oxford University Press. pp. 781–790. ISBN 978-0-19-553068-1. Wikimedia Commons has media related to Sula leucogaster.